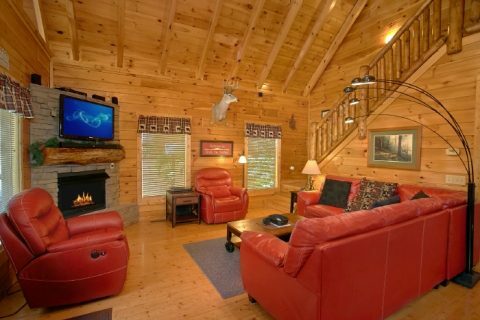 Experience gorgeous mountain views and a prime location near Dollywood when you book "Simply the Smokies!" Your 4 bedroom cabin in Pigeon Forge, TN is located in a beautiful spot in the Upper Middle Creek road area in Summit View Resort. 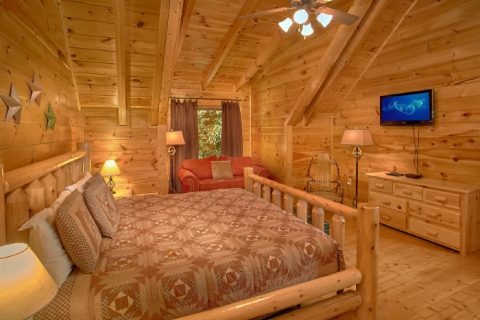 From here, guests will enjoy a short 6-mile drive away from Dollywood Theme Park and the thrilling attractions of the Pigeon Forge Parkway! 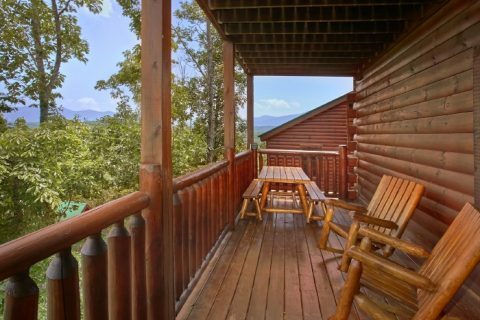 With quick access to great restaurants, shops, amusements, and big local events, you're sure to experience a terrific stay in the Smoky Mountains. 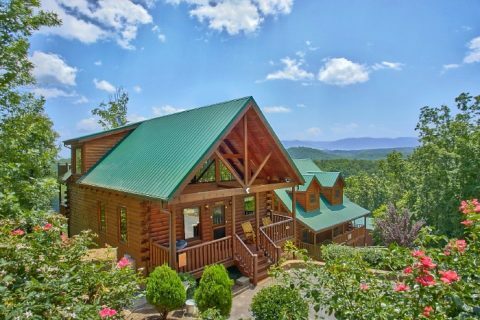 Once you arrive at your log cabin in the mountains above Pigeon Forge, you'll be thankful you booked a luxury cabin in such a beautiful location. 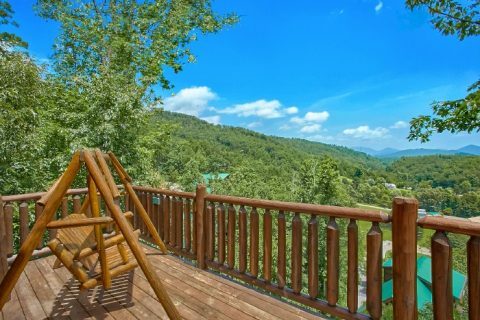 From the back deck, you can see for miles and admire the unforgettable scenery of the Smoky Mountains. 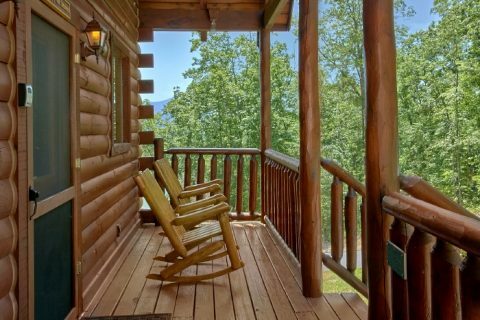 No matter the season of your visit, you'll be treated to stunning vistas year-round! 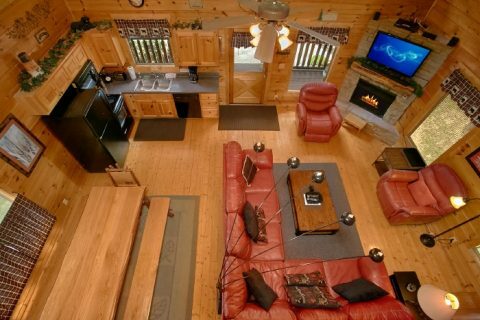 Inside your cabin on the main level, you'll find a welcoming living room complete with a stacked-stone gas fireplace with a large television above the mantel. 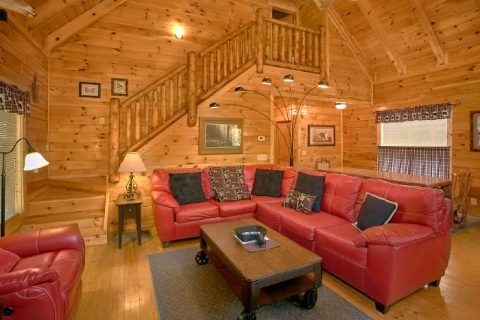 The comfortable furnishings also include a sleeper sofa for accommodating more guests. 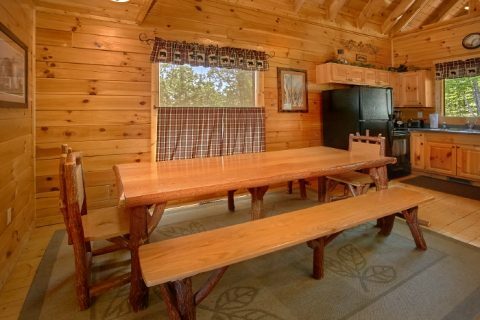 The nearby kitchen with a large dining room table makes the perfect space for enjoying dinners with family and friends. 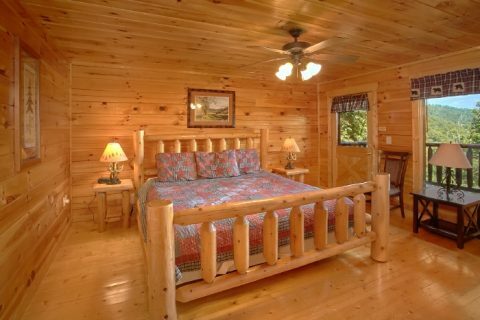 This floor is also home to a spacious king bedroom, complete with a television, access to a full bathroom, and jetted tub for personal relaxation. 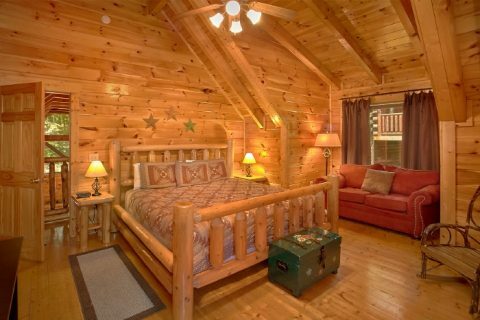 Another bedroom rests on the upper level of this cabin that also boasts a king-size bed, a private full bath with jacuzzi tub, television, and access to a balcony. 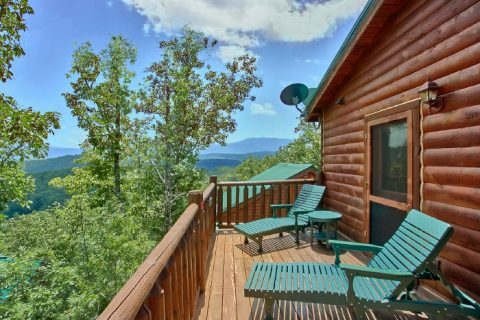 You'll love sitting outside on the balcony or taking a dip in the hot tub on the deck. 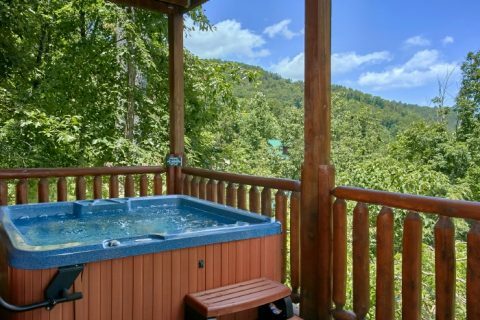 Let the warm, bubbling water and majestic mountain scenery take all of your cares and worries away so you can truly enjoy your vacation! 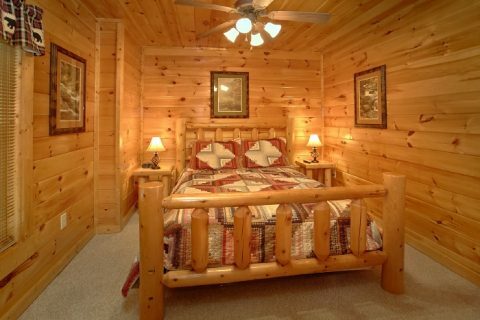 On the lower level, there are two queen bedrooms and best of all – a game room with a pool table and electronic darts! 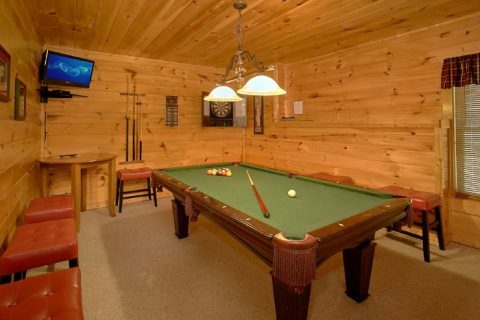 Enjoy hours of entertainment and hold a billiards tournament for some friendly competition. 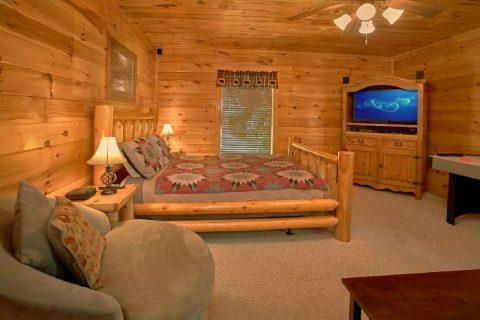 The game room also comes with a television for your convenience. 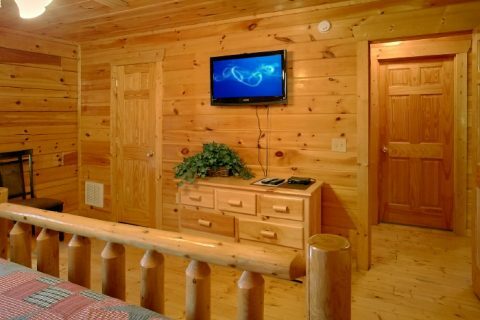 For extra guests and entertainment, one of the queen bedrooms comes complete with a sleeper sofa and an air hockey game. 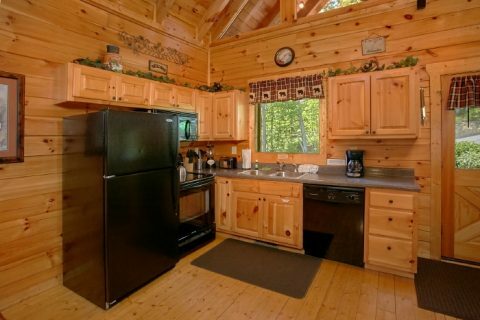 Another great feature your cabin provides is a charcoal grill for enjoying tasty meals hot off the fire. 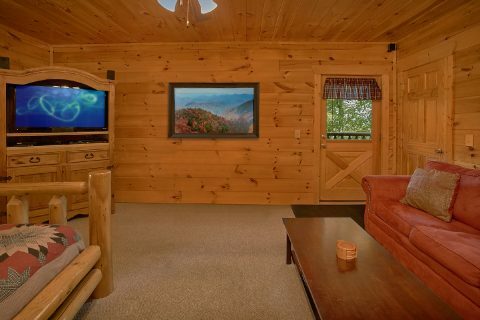 There's also WiFi Internet that's perfect for in-cabin entertainment or for planning your next day's adventure in Pigeon Forge and the Great Smoky Mountains! 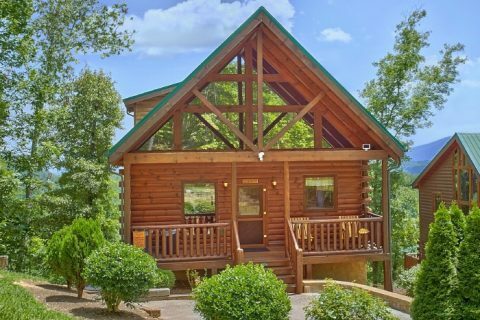 Book your luxury cabin with a view online with Cabins USA today and save 15% with our special discount!